The Sikorsky SH-3 Sea King (company designation S-61) is an American twin-engined anti-submarine warfare (ASW) helicopter designed and built by Sikorsky Aircraft. It was a landmark design, being the first ASW helicopter to take advantage of turboshaft engines, as well as being the first amphibious helicopter in the world. Introduced in 1961, it served with the United States Navy, and remains in service in many countries around the world. The Sea King has been built under license in Italy and Japan, and in the United Kingdom as the Westland Sea King. The major civil versions are the S-61L and S-61N. During the 1990s, the Sea King was replaced in the ASW and SAR roles by the U.S. Navy with the newer Sikorsky SH-60 Sea Hawk. However, the SH-3 continued to operate in reserve units in roles including logistical support, search and rescue, and transport. On 27 January 2006, the SH-3 was ceremonially retired at NAS Norfolk, Virginia, by Helicopter Combat Support Squadron 2 (HC-2). Interestingly, the VH-3, operated by the USMC is still the official helicopter for the President. The SH-3H was an upgrade of the SH-3G as an anti-submarine warfare (ASW) helicopter for the U.S. Navy. It included SH-3G features with improvements for ASW, anti-ship missile detection and other airframe improvements. 163 SH-3Gs were upgraded to SH-3H configuration. Some of these helos were originally SH-3A/D variants so you would find some pretty old airframes soldiering on until the SH-3 was finally taken out of operational USN service. This one continues the series of Sea Kings being produced by Dragon/Cyberhobby and is the ultimate Sea King variant with all the upgrades of the series. Quite a few excess airframes were available after the Sea Hawk started taking over and many had the interiors stripped of their equipment and turned into utility helos. I expect there will be a boxing to cover those at a later date. 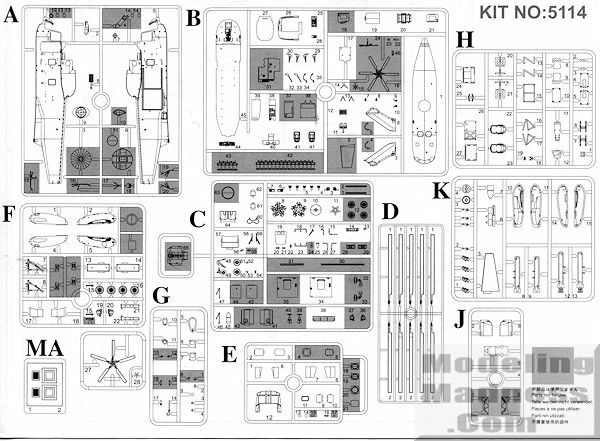 As you can see from the sprues image, quite a few of these sprues are common with other Cyber-hobby Sea King kits. There is a tiny photo etch fret that has pieces for the lower fuselage and upper nose. The cockpit is well appointed, including pedals, collective and cyclic controls. The cabin area includes new radio/display equipment, two seats for the systems operators, plus the active dipping sonar device (AN/AQS-13 or AN/AQS-18). The foldable rotor blades are made to true scale thickness and the rotor head is quite detailed. An interesting feature typical of all their Sea King kits, one has two sets of blades. One set has droop typical of the aircraft at rest while the other set is curved upwards as it would be in flight. These can also be modeled in the folded position, which provides the builder with the opportunity to take up less shelf space. There are the proper shape and size sponsons for this variant, complete with MAD drogue and torpedoes. The tail is separate, and while it is shown in the standard position, if one wishes, it makes a great starting place to model this one folded. Markings are provided for four aircraft all in the white over light gull grey scheme that is typical for ASW aircraft of the period. 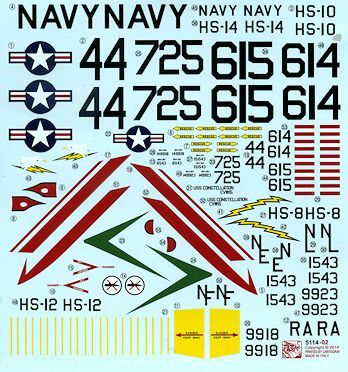 YHou have the box art aircraft from HS-10 at NAS North Island in the 80's. This was the training squadron. Other options are HS-8 on the USS Kitty Hawk in the 1960s, HS-14 on the USS Ronald Reagan in 1985 and HS-12 aboard the USS Midway in the 1980s. The decals are printed by Cartograf and are very nicely done. The only other folks I can recall who have done Sea Kings in this scale are Airfix with their SH-3D from the 'dark ages' and Fujimi, who also did a whole series of Sea Kings. 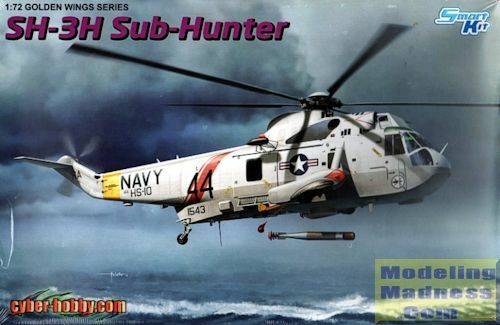 The Fujimi kits are still quite nice, but this one has greater detail and if you don't have a Sea King in your collection, is the one you should seek out. Thanks to www.dragonmodelsusa.com for the preview kit. You can find this kit at your favorite hobby shop or on-line retailer. If you would like your product reviewed fairly and fairly quickly, please contactthe editor or see other details in the Note toContributors.